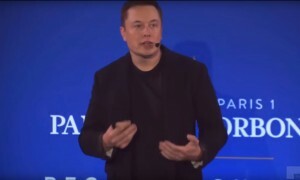 Elon Musk spoke to an audience at the Sorbonne in Paris on December 2 and urged people to support policies that will address the carbon dioxide levels in the atmosphere and climate change. 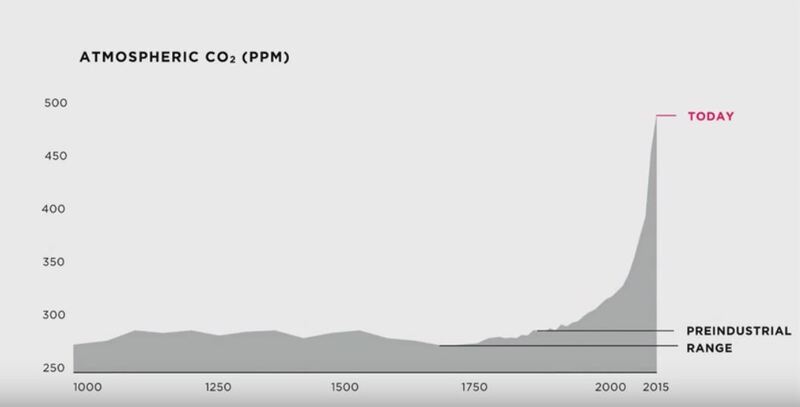 One of the charts Musk used to buttress his remarks (presented at the top of this page) shows that the increase in carbon dioxide levels is accelerating at an alarming rate. Some will remember that Al Gore was once pilloried as a lunatic for offering a very similar chart. But Musk isn’t laughing. He says if we do not alter our behavior as a civilization, the effects of our actions will exceed the damage caused by every war in history to date. Musk couched his main points in economics. He described the damage caused by burning fossil fuels as an “untaxed externality.” In other words, he said, our economic system is actually designed to reward those who extract and burn fossil fuels. He insists that the solution to mankind’s emissions problem is to eliminate the more than $5 trillion in direct and indirect subsidies the nations of the world provide annually to fossil fuel interests, according to the International Monetary Fund. Call it a carbon tax or carbon pricing, Musk says a way must be found to make all the costs of using fossil fuels be borne by those who burn them rather than allowing them to be foisted off on the others. He proposes a program that would be phased in gradually and provide relief for those whose lives will be adversely affected by a rise in fossil fuel costs. His remarks were very similar to those he gave while visiting in Germany earlier this year. Then and only then will the world transition to using renewable energy, such as wind, solar, hydroelectric and geothermal. Musk urged everyone in the audience to talk about the urgency of climate action with their family, friends and elected officials. You can watch the entirety of Musk’s remarks in the video below. Barney Frank once said if his office got one call on a subject, it was probably from a nut case. If his office got two calls on the same subject, it was a coincidence. But if 6 calls came in, it was a groundswell. In this instance, as in many others, if the people will lead, their leaders will follow. If you aren’t sure who your elected officials are or how to contact them, here is a very useful online tool you can use. Don’t put it off. Do it today.